A University of Dayton education isn?t limited to the Dayton city limits. Just ask the 500 students who are making the world their campus this summer. More than 500 students are earning academic credit or participating in service opportunities in more than 20 countries through international experiences led by the University. They’re learning about intercultural communication in Italy and the Czech Republic, and studying waterways in China. They’re helping develop high school curricula in Malawi and exploring religious life in the Vatican. In addition to the dozens of existing programs administered by the Center for International Programs, the University introduced three new ones in 2017 to expand global learning opportunities for students. Twenty-seven students participated in the new Communicating Across Cultures course, the first multi-site study abroad program led by faculty from the Department of Communication. From June 14-July 15, the students traveled through Italy and the Czech Republic to experience a variety of European cultural experiences. The Department of Health and Sport Science in the School of Education and Health Sciences also launched its first global offering this summer, with students exploring health and sport professions in Chile. Students from all disciplines could travel to Cusco and Lima, Peru, new sites for the University’s Spanish language immersion offerings. 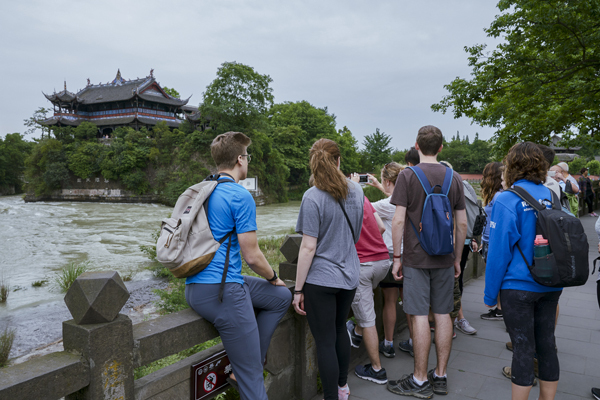 The University of Dayton and Fuyao Glass America teamed up to offer a new course utilizing sociology, political science and economics to study the effect of China's growth on its waterways, and included a three-week tour to examine key waterways first hand. Ten students, including nine from the University’s River Stewards program, completed the program at the University’s China Institute in the Suzhou Industrial Park. "Whether we live in China or here in Dayton, we all have riverfront property, because we all have neighbors either upstream or downstream," said sociology major Emily McAleese. Graduate assistant Katelyn Rendulic also joined the group of 10 students, who piloted the experiential learning course Socioeconomic Change in China: A Case Study of Suzhou and its Water, taught by past University president Daniel J. Curran. "Dr. Curran was our guide, connecting the trip and its lessons," she said. "What we learned can be a catalyst for the future, whether we're studying water quality in Dayton or at Lake Tai." Throughout the world, UD students are enhancing their educations through study abroad. In programs administered by the Center for International Programs, students are improving their language and intercultural skills with immersion experiences in France, Peru, Spain and Germany. In Germany, business students are touring corporations and government offices in the world’s fourth-largest economy and taking weekend excursions to Paris, Venice and Switzerland. Argentina gives graduate students a chance to learn about how to counsel diverse learners by gaining experience in local schools and communities. Students in the Doctor of Physical Therapy program will spend two weeks in Nanjing, China, in August to learn new practices and share their own. Our students are also studying social inequality, literature, faith and justice in Ireland and Northern Ireland; global manufacturing systems and local culture in the English Midlands; education in London and psychology in Florence. Through the Global Flyers program, honors students are taking their thesis research to London and Sikkim, India, for experiential learning and scholarship, including research at Oxford University, internships in London or fieldwork on nutritional security in partnership with the Hanley Sustainability Institute and the Mission of Mary Farm. In Guatemala, students are improving their knowledge of Spanish while exploring different cultures, religions and politics. Marianists in Lusaka, Zambia, are hosting students for a week so the students can visit tourist destinations and adjust to living in the southern African country. After Lusaka, students travel to Lubwe to work in hospitals and schools. They've been able to teach classes, and premedical students have shadowed doctors and nurses to learn more about medicine in rural parts of the country. The ETHOS program has been sending engineering students abroad since 2001, mainly providing summer experiences but recently starting to provide semester-long immersion experiences. ETHOS also has opportunities for graduate students. Malcolm Daniels, academic director for the program, said students are spending 10 weeks working with non-governmental and nonprofit organizations in Nicaragua, Guatemala, Bolivia, Malawi, South Africa and India. ETHOS students have worked on projects with their host communities that have included building solar photovoltaic systems, developing clean burning stoves, and installing clean water systems. In the Department of Political Science’s undergraduate research program in Malawi, students are designing projects to help advance human rights and address development issues such as secondary education needs, life skills training for girls and water security in rural settings. Their findings are presented to community members to help them solve these issues. It also gives students life-changing experiences and ample opportunities to interact with the people living in the southern African country. This summer, five UD students traveled to Malawi, including a student from the School of Education and Health Sciences who helped education professors Connie Bowman and Novea McIntosh develop a curriculum for a new high school scheduled to open this fall. Travel abroad for our students doesn't end with the summer. Now in its second year, the Semester Abroad and Intercultural Leadership (SAIL) program, offering a fall semester studying either in China, Ireland or Spain followed by a spring semester intercultural leadership program which includes special learning-living housing.